In the recent past, there has been an alarming rise in patients presenting with atypical clinical types of dermatophytosis. These patients require prolonged treatment with systemic and topical antifungal agents. In majority of patients, close household contacts are affected. Frequent relapses and extensive disease affect the quality of life of the patient significantly. The emergence of such a challenging scenario is attributed to complex interplay of host, environment, and agent factors. The change in prevalence of dermatophytes causing the disease; host factors such as comorbidity and immunosuppression; and hot and humid climate, lifestyle changes, and poor hygiene are responsible for atypical dermatophytosis. Several atypical clinical types such as psoriasis-like, eczematous dermatitis-like, seborrheic dermatitis-like, and rosacea-like have been reported. Hence, dermatophytosis has been suggested to be included in the list of great imitators. The collaborative effort involving dermatologists, microbiologists, and public health professionals is required to address this emerging public health problem. The antifungal drug market in India has grown by more than 100% in recent years following the epidemic-like situation of dermatophytosis in the country. Almost every other pharmaceutical company has started marketing various antifungals drugs. The quality and bioavailability of some of the antifungal drugs by mushrooming companies are feared to be substandard which may add to this growing menace of difficult to treat dermatophytosis. Recurrent dermatophytosis is the topic of discussion in almost every social media groups of Indian dermatologists. In recent years, in almost all Continued Medical Education programs and Conferences in India, there are dedicated sessions on dermatophytosis, and two theme-based conferences are planned in year 2017. While this enigmatic form of dermatophytosis started around 2010 in India, the proportion and severity of such forms of clinical disease have further worsened in the past 2–3 years. Depending on clinical settings, almost 15%–20% of patients in dermatology outpatient departments and clinics present with recalcitrant dermatophytosis. Children including infants with facial involvement and adults with tinea capitis have become a frequent clinical presentation. Treatment of widespread tinea in pregnant women has become a dermatologist's nightmare. With fast-growing problem in the country, dermatologists are facing new therapeutic challenges such as antifungal therapy in patients with comorbidities such as diabetes, hypertension, heart disease, and chronic liver and kidney disorders, and clinically significant drug interactions associated with concomitant management of these disorders. Many patients resorting to faith healers, quacks, indigenous medicines, and religious beliefs such as holy bath is worsening the problem. There is a constant evolution of the dermatophytes influenced by the geographic and socioeconomic conditions. About one century ago, Epidermophyton floccosum, Microsporum audouinii, and Trichophyton schoenleinii More Details were the major pathogens causing dermatophytosis, but their frequency decreased, and now they are limited to some less developed countries. Now, Trichophyton rubrum has become the leading pathogen of skin and nail fungal infections followed by Trichophyton mentagrophytes. Similar trends are also being observed in epidemiological studies across India where T. rubrum and T. mentagrophytes are reported as the most common pathogens causing dermatophytosis. These changes in the prevalence of causative organisms/species can be due to local socioeconomic conditions and cultural practices. 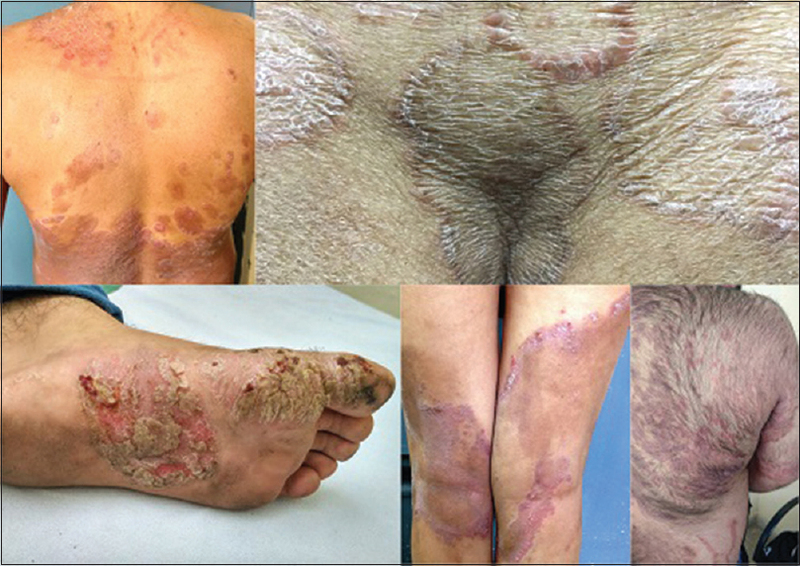 Different types of dermatophyte pathogens have been associated with multiple unusual clinical manifestations such as the circumscribed scleroderma, crusty circular plaques, white paint-like dots, psoriasis-like lesions, or dystrophic onychomycosis due to Microsporum gypseum infection. In their study of atypical dermatophytosis, Atzori et al. reported T. rubrum, T. mentagrophytes, and Microsporum canis as the most common isolated organisms. Other dermatophytes that have been reported to be responsible for atypical manifestations are Trichophyton interdigitale, Trichophyton tonsurans, Trichophyton verrucosum, and M. gypseum. Besides the species and invasive capacity of dermatophytes, the clinical manifestations of dermatophytosis may also depend on host factors such as site of invasion, physiological variation of host skin barrier, age of patient, obesity, immunosuppressive state, and acquired conditions such as excessive washing or sun exposure. Anatomical characteristic of affected area which includes the presence of skin folds, sebaceous glands, variable thickness of the corny layer, and vellus hair follicle involvement also affects the typical centripetal progression and favors inflammation and crusting. The dermatophytic clearance from the skin is secondary to the activation of cell-mediated immunity (CMI) and is Th1/Th17 dependent. Immune dysregulation with skewed immune response toward Th2 cytokines with high levels of IgE and IgG4 antibodies may be responsible for some of these atypical, chronic, or unusual clinical forms. Sometimes, the comorbid conditions of host-like psoriasis, atopy, and diabetes may be the cause of this immune dysregulation and the subsequent clinical manifestation of tinea., The exact mechanism involved in this defective shift of immunity and selective absence of CMI with respect to dermatophytosis is not well understood. Defective phagocytosis and processing of the fungal hyphae by the macrophages, neutrophils, or decreased complement levels may be another factor which could lead to more severe deep dermatophytosis. Caspase recruitment domain-containing protein 9 (CARD9) gene mutation, which is involved in the regulation of multiple downstream pathways having antifungal response, is noted to be associated with severe fungal infections of varied clinical presentations ranging from deep dermatophytosis to recurrent dermatophytic infection of skin and nails. There is an increased prevalence associated with the disorders of keratinization such as ichthyosis vulgaris where retained keratin often acts as a nidus for infection. Dermatophytes are abundant in different ecological niches, and the three main sources of infection by dermatophytes are humans, animals, and soil. Dermatophytes have the ability to utilize keratin from human and animal tissues, or debris from dead animal sources found in soil, such as feathers, skin, or nails. Dermatophytes from all these three sources can infect humans through direct or indirect contact, causing dermatophytoses manifested in different clinical entities. Transmission of dermatophytosis occurs almost exclusively through indirect contact, as the dermatophytes initially contaminate the patients' environment and subsequently facilitates the spread of infection to others. Dermatophytes are found universally; however, the relative prevalence of dermatophytoses caused by different dermatophytes may vary in different geographic areas according to climatic conditions or lifestyle. Hot and humid climate, low socioeconomic status, overcrowding, sharing of clothes and footwear, poor hygiene and sanitary conditions, and migration of population are also some predisposing environmental factors in Indian scenario which may be responsible for the increasing chronic and recurrent forms of dermatophytosis. In addition to the above-mentioned factors, other causes could be incorrect diagnosis, immunosuppression, and suboptimal dose or duration of therapy. Reinfection from the contacts or fomites may also be a contributing factor, especially for chronic/recurrent dermatophytosis who have multiple affected family members. However, all the above host, pathogen, and environmental risk factors are well known [Table 1], what has led to this fast-growing epidemic-like proportion of recurrent and chronic forms of difficult to treat tinea is an enigma posing a great management challenge to dermatologists. There are cases with unusual manifestation of tinea which are termed as atypical tinea though it is not synonymous with tinea incognita. The term ''tinea incognita'' is generally used for steroid modified cases of dermatophytosis although subsequent reports have shown tinea incognita with tacrolimus and pimecrolimus as well. Atypical tinea can be seen in immunocompetent patients who are not using any topical and systemic medicaments such as corticosteroids. 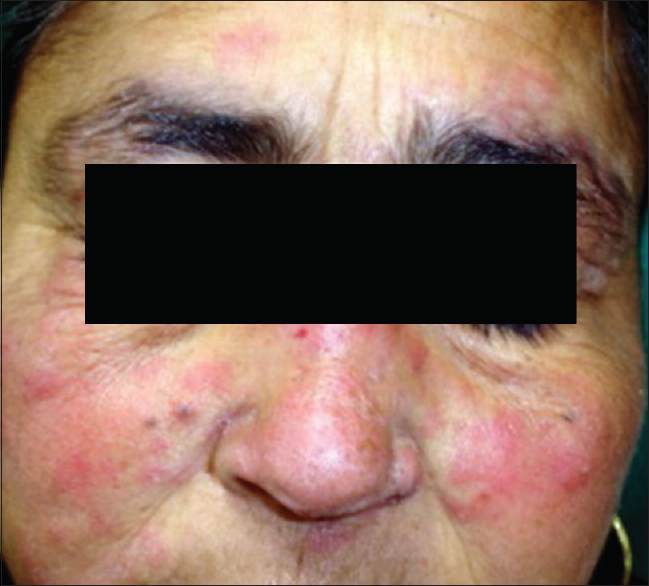 Cutaneous dermatophytosis may sometimes mimic other dermatoses and multiple atypical clinical varieties have been reported which include erythema multiforme-like, seborrheic dermatitis-like [Figure 1], lupus erythematosus-like [Figure 2], dermatitis herpetiformis-like, rosacea-like, eczematous dermatitis-like [Figure 3], psoriasis-like [Figure 4], impetigo-like, and polymorphous light eruption-like [Table 2]. Although these are more common in immunocompromised individuals, they can be seen in immunocompetent persons as well. Such clinical presentations of tinea though rarely reported in literature are now being routinely seen in India. Tinea has now qualified for the category of great mimicker similar to syphilis, sarcoidosis, and mycosis fungoides. Besides, the classical erythematous annular plaque with a scaly, centrifugally advancing borders, the dermatophyte infections can sometimes present in atypical morphologies such as pyoderma, bullous [Figure 5], eczematous, purpuric, or nodular lesions., There are few case series of atypical tinea infection from different countries. In one of such reports, Atzori et al. observed eczema-like tinea as the most common atypical manifestation of tinea. Among patients with atypical tinea lesions, 20% had previous cutaneous illnesses such as atopic dermatitis, contact dermatitis, lichen planus, and psoriasis. Asthma, allergic rhinitis, intestinal inflammatory illnesses, and chronic renal insufficiency were present in 15%, and 23% of them had not applied topical corticosteroids or taking on systemic therapy that could have modified primary morphology. Dermatophytes are generally confined to the stratum corneum or the epidermis, and the normal defenses that prevent the deeper invasion of dermatophytes are physical barriers (epidermal keratinization, epidermal keratinocyte turnover, pH, fatty acids from sebaceous glands, and body temperature), innate and adaptive immunity, and serum components, but rarely they may invade the dermis and cause granulomatous inflammation which may manifest as nodules. The diagnosis in these atypical cases can occasionally be missed by false-negative results from culture or even the KOH preparation. The presence of Periodic acid-Schiff-positive fungi in stratum corneum or hair follicles along with spongiotic dermatitis and neutrophils in the stratum corneum on histopathology is helpful in making the diagnosis in these difficult cases. In addition to these atypical and emerging variants of dermatophytosis, another variant that is seen very frequently all over India is a recurrent infection or tinea recidivians. Steroid abuse in the form of combination formulations may be one of the most important predisposing factors in these resilient forms of dermatophytosis. It is being proposed that these manifestations are due to resilient organisms rather than resistant organisms. Resistance is characterized by nonresponsiveness to the treatment whereas the recidivans or the recurrent forms are characterized by response to the treatment initially and relapse within a week of stopping treatment or while on treatment. It is characterized by lesions appearing at the periphery of the healing patches [Figure 7]. The organisms isolated from these are T. rubrum and T. mentagrophytes. Unlike in the case of antibiotic resistance, there is little clinical correlation with in vitro antifungal drug susceptibility tests. Fungal infections caused particularly by candida and invasive molds seem to have evolved and are now becoming the leading cause of mortality in sick patients admitted in hospital Intensive Care Units. Increasing prevalence of deep fungal infections and antifungal resistance is a global phenomenon. Superficial dermatophytosis too seems to be following the same pattern as we are seeing more and more cases of chronic and recurrent as well as atypical dermatophytosis. There is an urgent need to study the risk factors and predisposing conditions to effectively manage these cases. We also need epidemiologic studies to clarify the determinants of the trends and identify effective interventions that can reduce the morbidity associated with these dermatophytoses and the general public health burden of illness. These questions should be addressed jointly by clinicians, mycologists, and public health authorities at national and international levels. Sahoo AK, Mahajan R. Management of tinea corporis, tinea cruris, and tinea pedis: A comprehensive review. Indian Dermatol Online J 2016;7:77-86. Dogra S, Uprety S. The menace of chronic and recurrent dermatophytosis in India: Is the problem deeper than we perceive? Indian Dermatol Online J 2016;7:73-6. Zhan P, Liu W. The changing face of dermatophytic infections worldwide. Mycopathologia 2017;182:77-86. Atzori L, Pau M, Aste N, Aste N. Dermatophyte infections mimicking other skin diseases: A 154-person case survey of tinea atypica in the district of Cagliari (Italy). Int J Dermatol 2012;51:410-5.
de Sousa Mda G, Santana GB, Criado PR, Benard G. Chronic widespread dermatophytosis due to Trichophyton rubrum: A syndrome associated with a Trichophyton-specific functional defect of phagocytes. Front Microbiol 2015;6:801. Hay RJ. Chronic dermatophyte infections. I. Clinical and mycological features. Br J Dermatol 1982;106:1-7. Jones HE, Reinhardt JH, Rinaldi MG. Acquired immunity to dermatophytes. Arch Dermatol 1974;109:840-8. Lanternier F, Pathan S, Vincent QB, Liu L, Cypowyj S, Prando C, et al. Deep dermatophytosis and inherited CARD9 deficiency. N Engl J Med 2013;369:1704-14. Boralevi F, Léauté-Labrèze C, Roul S, Couprie B, Taïeb A. Lupus-erythematosus-like eruption induced by Trichophyton mentagrophytes infection. Dermatology 2003;206:303-6. Romano C, Massai L, Strangi R, Feci L, Miracco C, Fimiani M. Tinea corporis purpurica and onychomycosis caused by Trichophyton violaceum. Mycoses 2011;54:175-8. Kim HS, Cho BK, Oh ST. A case of tinea corporis purpurica. Mycoses 2007;50:314-6. Lillis JV, Dawson ES, Chang R, White CR Jr. Disseminated dermal Trichophyton rubrum infection - An expression of dermatophyte dimorphism? J Cutan Pathol 2010;37:1168-9. Kaneko T, Kaneko M. A patient with cystic granuloma trichophyticum who required surgical resection. Med Mycol J 2017;58:E29-32. Nishiyama C, Miyaji M, Saheki M, Morioka S. Studies on the parasitic forms of Trichophyton rubrum isolated from patients with granuloma trichophyticum using the “agar-implantation method”. J Dermatol 1985;12:325-8. 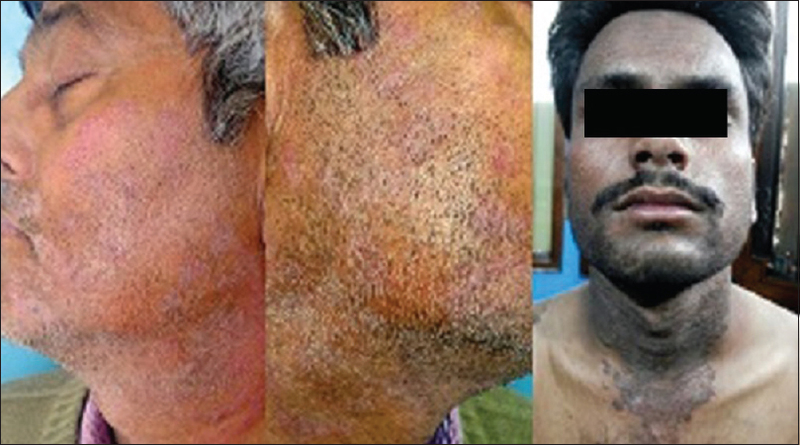 Sonthalia S, Singal A, Das S. Tinea cruris and tinea corporis masquerading as tinea indecisiva: Case report and review of the literature. J Cutan Med Surg 2015;19:171-6. Verma S. Tinea pseudoimbricata. Indian J Dermatol Venereol Leprol 2017;83:344-5. Feng J, Liu F, Wu F, De Deng Q, Zeng HM, Kong TQ, et al. Tinea infection with scutula-like lesions caused by Microsporum gypseum in a SLE patient: Case report and literature review. 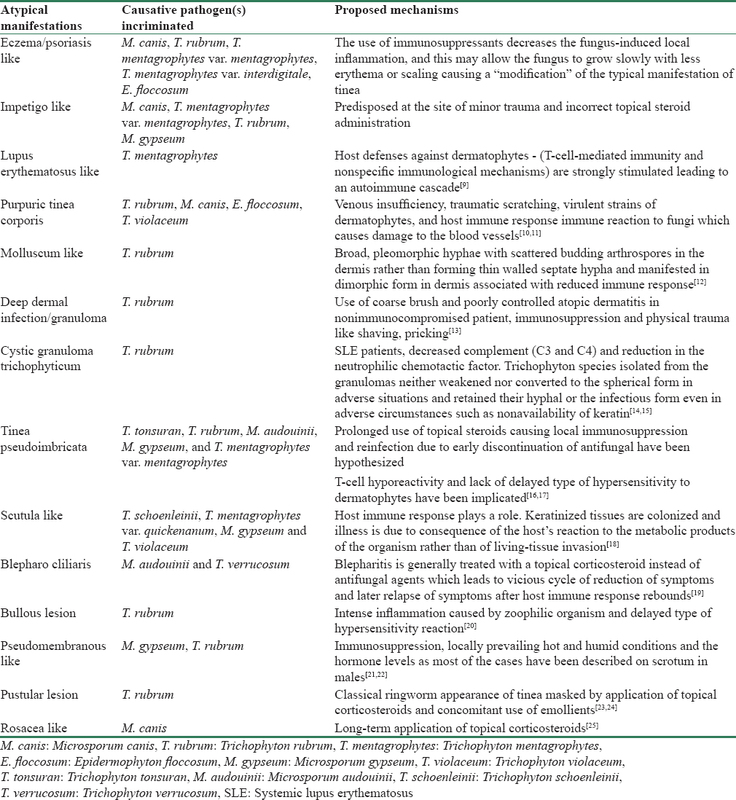 Mycopathologia 2013;176:255-8. Sahin GO, Dadaci Z, Ozer TT. Two cases of tinea ciliaris with blepharitis due to Microsporum audouinii and Trichophyton verrucosum and review of the literature. Mycoses 2014;57:577-80. 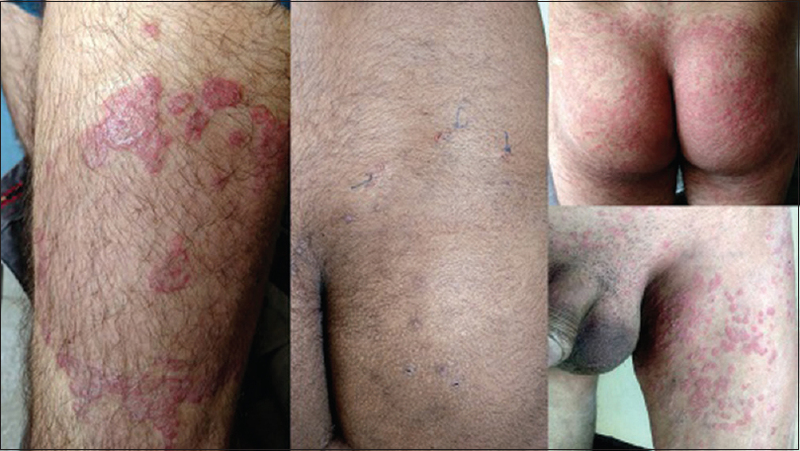 Vinay K, Mahajan R, Sawatkar GU, Kanwar AJ, Kumar M. An unusual presentation of tinea cruris with bullous lesions. J Cutan Med Surg 2013;17:224-5. Tan H, Lan XM, Zhou CJ, Yang XC. Pseudomembranous-like tinea of the scrotum infected by Microsporum gypseum in a young man. Indian J Dermatol 2015;60:422. Lu S, Xi LY, Zhang JM, Lu CM. Pseudomembranous-like tinea of the scrotum: Report of six cases. Mycoses 2009;52:282-4. Bornkessel A, Ziemer M, Yu S, Hipler C, Elsner P. Fulminant papulopustular tinea corporis caused by Trichophyton mentagrophytes. Acta Derm Venereol 2005;85:92. Serarslan G. Pustular psoriasis-like tinea incognito due to Trichophyton rubrum. Mycoses 2007;50:523-4. Gorani A, Schiera A, Oriani A. Case report. Rosacea-like tinea incognito. Mycoses 2002;45:135-7.